This season will complement Equinox for early starts and/or rooted cuttings ready to begin the first stages of vegetative growth. Modeled after natural elemental releases during the Mediterranean Spring season, and matching exactly what nutritional profiles the plant desires during this young fragile time in its life. Spring is designed to be used in conjunction with Equinox. 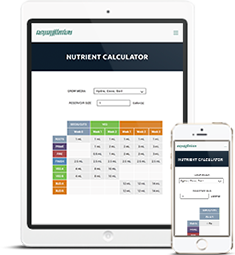 Dosage and dilution ratios are customizable to harness the perfect start to your crops season, but a dilution ratio of 1 part Equinox to 3 parts Spring Green is recommended. When used with Equinox, Spring Green will significantly reduce transplant shock in rooted seedlings or cuttings that are initially transplanted from the propagation stages. Specific proportions of N-P-K and micronutrients provide small plants everything they need to jump start into immediate root, shoot, and foliar development. Once plants have reached approximately 6 to 12 inches on Spring Green, switch to Summer Shift in order to boost nitrogen supplementation and harness larger vegetative frame building. 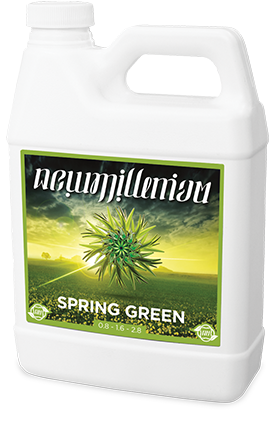 Spring Green (PART B) will compliment Equinox (PART A) and is formulated to promote vigorous growth during the early vegetative phase of plant development. This specialty fertilizer can be used with any soil or growing medium and is intended primarily for non-farm use, such as home gardens. Dilute in water at a 1:3 ratio with Equinox until desired EC/PPM levels are met. 1 part Equinox with 3 parts Spring; 3mL Equinox with 9mL Spring; 4mL Equinox with 12mL Spring.